2016 Christmas Ornament by Little House Needleworks - 40 ct. Pearled Barley (recommended threads except I used GAST Oatmeal instead of CC Khaki Mocha). Joyfulness Little Sheep Virtue by Little House Needleworks - 40 ct. Vintage Examplar and DMC threads (1 over 2). Knitted Round Dishcloth - Kitchen Cotton and US size 7 needles. 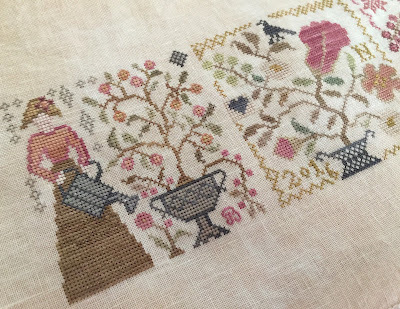 Little Sheep Virtues by Little House Needleworks - 40 ct. Vintage Examplar (all on same piece of linen) and DMC (1 over 2). 4 Seasons by Lizzie Kate - 40 ct. Vintage Country Mocha and Weeks Dye Works (1 over 2). 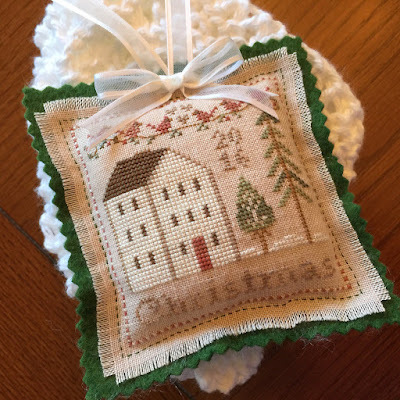 Peppermint Twist Ornament by Little House Needleworks - 32 ct. Vintage Pear and CC, WDW and DMC (2 over 2).